Particularly during the day, when the distracting neon is dimmed, the dirty and not in the least glamorous underbelly of Shinjuku is there for all to see. The squalor. Sleazy touts. Its truly dizzying array of adult-related shops. And yet without them, Shinjuku would more than likely just be another drearily homogenised district, rather than the truly fascinating city it actually is. Simply amazing. Beyond the look of whatever our TV sets have told us via all those documentaries, it is the day to day, those rigid faces of a blocky city, which are the most appealing. Great picture. Must smell great. And that girl walking by is very cute. Thanks a lot. I’m very pleased with it. So much better! You seem to have everyone’s attention, except for perhaps the dog who has its eyes on a quick forage! Was it a conscious intention to note the woman on the ad. board is pointing? Yes, it certainly seems that way, doesn’t it? All eyes on the gaijin! It’d be nice to say yes, but nah, I was aware of the face, but hadn’t noticed the pointing. Instead, it was a nice little surprise to find later. Oh dear! 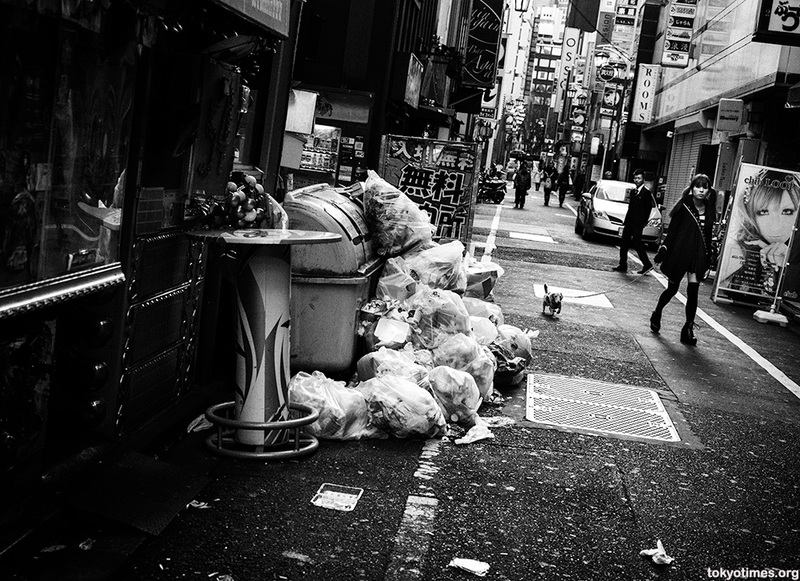 The rubbish bins were overflowed … I wonder what is the dog’s reaction when walked passed? I don’t really like to go to Shinjuku because it is always very crowded and noisy. But also a happening and interesting place! I can understand that. Know a few people who feel exactly the same. Surprised to see garbage at all…never saw it when I was walking around. Yes, it works almost like magic!